Finlux 32H7020-D 3D TV review - in case you are in the search of an affordable 3D TV you should definitely check this 32-inch LED TV by Finlux. This brand offers many different products at very low prices and usually the quality is good. The 32H7020-D 3D TV offers picture in 720p HD resolution and the chance to experience the real 3D movie experience in your home. The refresh rate of the Finlux 32H7020-D is quite low, just 50Hz. Finlux 32H7020-D also offers some interesting features like the built-in PVR function which enables you to Rewind, Pause and Record TV directly onto any USB plug-and-play flash drive, or USB hard drive. This TV comes with Freeview tuner as well. The media interfaces in the 32H7020-D include 2x HDMI ports and USB-in which allows you movie and music playback. Finlux 32H7020-D is also wall mountable so you can easily fix it wherever you like. 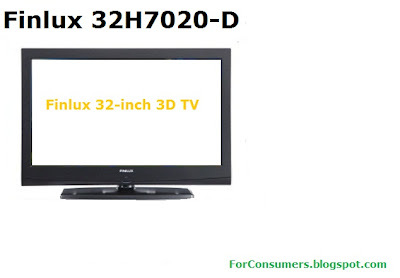 The dimensions of the TV are H:556 x W:783 x D:187 mm. Usually this 32-inch 3D LED TV comes with pair of 3D glasses. The lowest price you can find the 32H7020-D is around £200 which makes it one of the cheapest 32-inc 3D TVs on the market. I hope you enjoyed my short Finlux 32-inch 3D TV review. Please let me know what do you think about Finlux TVs or do you own one, I will be happy to get some more in-depth first hand user information.